Returning to the Senate despite a diagnosis of brain cancer to cast a vote to begin debate on a bill to replace the Affordable Care Act, Senator John McCain delivered an eloquent speech, sounding a clarion call for bipartisanship. “I’m not sure we can claim that distinction with a straight face today,” said McCain, a long-time Arizona senator who was the Republican nominee for president in 2008. 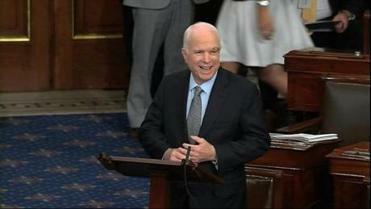 The following are the remarks that John McCain delivered on the Senate floor, as provided by his office. But he urged his fellow senators to work together to pass legislation. “Stop listening to the bombastic loudmouths on the radio, and television, and the Internet. To hell with them!” he said, provoking applause from the chamber. “Let’s trust each other. Let’s return to regular order. We’ve been spinning our wheels on too many important issues because we keep trying to find a way to win without help from across the aisle,” he said. “We are getting nothing done, my friends, we’re getting nothing done,” he said. “Let’s see if we can pass something that will be imperfect, full of compromises, and not very pleasing to implacable partisans on either side, but that might provide workable solutions to problems Americans are struggling with today,” he said. “What have we to lose by trying to work together to find those solutions? We’re not getting done much apart,” he said.